These much ignored pieces of rural and urban furniture finally have a website of their own. This is not the site to visit for technical information pertaining to telegraph poles. You'll find nothing about 10KVa transformers, digital telephone networking or even so much as a single volt. This is a website celebrating the glorious everyday mundanitude of these simple silent sentinels the world over. We don't care what the wires contain either. They all carry electricity in some way be it the sparky stuff which boils your kettle, or the thinner stuff with your voice in it when you're on the phone. Many people, my wife included, upon being gifted a parcel like that at left, might be inclined to think “what the hell did I do to deserve this?” But to a severe sufferer of Anoraksia Nervosa, like myself, such a receipt is a delight. It’s arrival preceded also by the entertainment watching our flimsy postman struggle first to lift it out of his van, and then to reach over our gate to wedge it into my letter bin. I must confess that these have actually been through a scrub in the kitchen sink before being put back in the box for this photo. One of them – the darkened one in the photo – is an old L.M.S. (London, Midland & Scottish) insulator. It’s seen some severe high-voltage arcing in it’s working life by the look of it. Very many thanks to Mark Taylor from Sutton Coldfield who answered my appeal for ceramics. A cheque to cover the postage is on its way, along with some carefully chosen pure thoughts and our good wishes. As you can see, I've been very busy in my shed of late. Braving the cold, the drizzle and the incredible drafts that howl through the gaps in my jerry-self-built workshop. 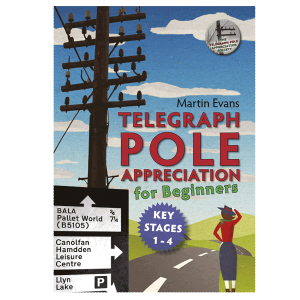 If you were to stop Joseph and Mary Public in the street, point them at either an electricity DP or an aged GPO pole and ask “What is that?” 99.9% of the time, I am sure, you will hear the answer “A telegraph pole”. And it is on that premise that this site operates. That and the fact that all wire-carrying wooden poles, as far as I am concerned, have an essence of whimsical poetry all of their own. There they stand, silent sentinels, forever observing us who scurry about beneath them, oblivious. I’ll get my coat. You normally only ever see poles like this alongside heritage railway lines. But this is one of a few such poles that run from the village of Clawddnewydd along the B5105 down towards Ruthin in Denbighshire, North Wales. And even more amazing, this one is still in use. The second lower left insulator has a telephone wire attached. I went and photographed most of these recently and I don’t expect they’ll be left up much longer – replaced by an anonymous pole with a non-descript plastic junction box like all the others. Firstly, more serendipity. The problem of the missing 3 ceramic terminators has been solved. I have been walking the same route along the lanes at home for a near geological timescale. Yet last Friday evening at dusk, and completely unseen in all the previous 16,409 times that I have passed it, I spotted an ancient “arms wood” with 3 GPO insulators in immaculate condition. At some time in the distant past this had been removed from the pole nearby and the farmer had used it to block a hole under his sheep fence. Whistling nonchalantly, I clambered up the bank and quickly relieved it of the ceramics. Some people would be astonished that something as mundane as this could make my day. The very next evening I went back and recovered the wood too – making good the hole in the fence with an old plank of my own. Another piece of telegraph pole history to restore. Cannot recomend rapid drying of arms wood which could lead to deep cracking of timber known as ‘shaking’ in the trade .Store outside under cover until comparative weights of samples indicate desired moisture content. Or you could just leave them till they look ok.
Alas, this counsel came a little too late – after just an hour in my warm office the black wood tar seen at left, oozed from the wood I had just rescued and stuck to anything that touched it. The smell has only just cleared days later. Anyway, that formula all sounds a bit much like school algebra, so the “leave them till they look ok” bit will more suit my modus operandii. What sort of body is it that doesn’t have a mission statement? A little light to medium spannering, some sawing and a modicum of mild to serious swear words and the “arms wood” of my telegraph pole restoration project lay in its constituent parts upon my workbench. According to the society Honorary Technical Advisor, Keith S*****, the wood for the arms is an African hardwood called Keruing. If you’ve got any of these things floating around your garden, shed, garden shed or that drawer in your kitchen where you keep all the junk and which never opens properly – then I’d be very interested to hear from you. They are GPO standard ceramic terminators and they’re slowly disappearing from the wild. My restoration project has stalled slightly because I have two of these insulators in a very poor condition. They have clearly broken in the past and some long-forgotten GPO engineer has glued them back together – araldite probably or perhaps a half-chewed Werther’s Original. Anyway, I can’t get them off the retaining bolts and so am seeking replacements. There are some spare ones sitting on a disused pole not half a mile from my house. But alas they’re just out of my reach. Please email me martin@telegraphpoleappreciationsociety.org if you can help out. I now require 3 insulators. My wife broke one after I had left them in the sink to soak along with the breakfast dishes. I have to wonder if she’s as 100% committed to this as I am – she wasn’t even sobbing uncontrollably when she told me! This rather seductive looking pole has been hiding in a field less than a mile from my house. A telephoto lens was required to get this picture. But anyone who fails to see the intrinsic feminine beauty of this power distribution pole – needn’t apply to our society for membership. She’s called Audrey by the way. The entire administration department of the Telegraph Pole Appreciation Society recently undertook a sojourn to the Peoples’ Republic of Ireland. Our mission was primarily one of pantomime observance, but we never miss an opportunity to gaze in wonder at Johnny Foreigner’s public infrastructure. And there were many telegraphpolic marvels to behold I can (and will) tell you. Not least this amazing structure, made entirely out of telegraph poles spotted on a roundabout in Letterkenny, Co. Donegal. Pleasing to the eye it might be, but as a children’s fairground ride it fails miserably – the little mites just get splinters all over their backsides, and however much you push it, the damn thing just refuses to spin. Clearly some thinking through required next time.